PERSON: You ride your bike to work? PERSON: How far is it? PERSON: But how do you ride? There are no bike paths. ME: I usually just take surface roads in the most direct route I can. There are a couple of shortcuts I take to avoid particularly annoying intersections. PERSON: You ride on THE ROAD!?! Like with cars and stuff !?! Most people think nothing of driving everywhere but are completely terrified of the possibility of riding a bicycle in traffic. Guess how many fatal bicycle crashes there were in 2007? fatal motor vehicle crashes there were in 2007. The other thing to keep in mind is that 700 number includes all of the people who were doing stupid things like riding without a helmet down the wrong side of the road in the dark with no lights. So I think we can stop quibbling about safety and start talking about how YOU TOO can learn to ride in traffic without constant fear of death or injury. (in case you missed it) HELMET. In many cases, a bicycle fatality can be turned into a bicycle injury accident just by WEARING A HELMET. Flashing lights if you're riding in low-light conditions. Make sure you have lights for front and back. I have one of these for the front and one of these for the rear. Rear-view mirror. While not required, one of these can be helpful when changing lanes and keeping an eye on traffic behind you. There are glasses mounted and helmet mounted varieties. This next area focuses on how you ride. Obviously how you ride is important for safety reasons. But it's also important because, when you're out on the road, you're representing all cyclists. Every bad interaction you have is a black mark against all of us. That person will be less and less forgiving and considerate each time they come across a cyclist in the future. DON'T ride on the sidealk. DON'T run red lights and stop signs. DON'T weave in and out of traffic. DO obey lane designations. That means turn left from the left lane, respect right-turn and left-turn only lanes, etc. Part of the reason for the bad blood between so many cyclists and so many drivers is the erratic behavior of many cyclists. That means drivers don't know how a cyclist is going to behave in any given situation which leads to misunderstandings and frustration all around. There are few other strategies that I use to establish my space on the road. I usually ride 6" - 12" into the lane rather than riding on the shoulder. This may feel counterintuative since you're out in traffic even more but I've noticed a big shift (for the better) in how cars behave towards me since I started riding this way. Being out a bit in the flow of traffic forces cars to be more aware of you and give you a reasonable about of room when passing. I see this behavior a lot, especially in residential neighborhoods. A cyclist is riding up a street with lots of parked cars. 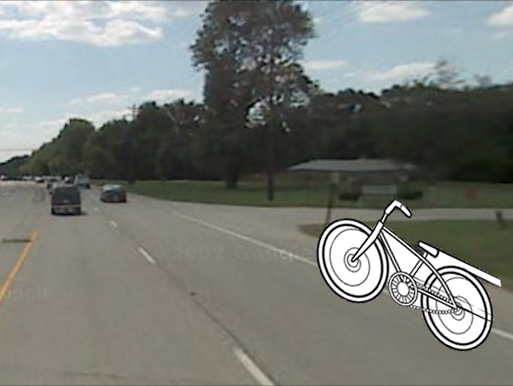 Everytime the cyclist gets to a large gap between the cars, they move over closer to the curb. When the gap ends, they move back out to go around the next set of cars. This is dangerous. You're essentially having to merge back into traffic over and over again and you're decreasing your visibility at the same time. 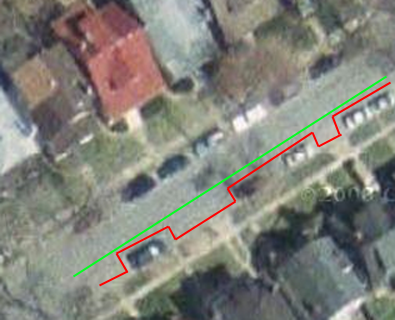 My preferred strategy is to pick a line that avoids all parked cars and maintain that line, and here's the important part, even when I have room to my right. Another example would be a road that has three lanes but the right lane changes to right-turn-only after a block or so. My approach is to ride down the middle lane rather than having to merge out of the right-hand lane as I get closer to the light. It does mean I have cars passing me on the right and the left but I still feel safer with that than making an extra lane-change. Here's the scenario. You're riding down the road and someone passes you, way too close, honking and yelling. What's your first instinct? Shout something back? Flip them off? I know that's my overwhelming urge but it's better for everyone if you can take a deep breath and let that righteous anger go. Conversely, if a car does something nice, wave! Smile! If you're in a situation where they'll be able to hear you, throw a "Thank you!" their way. If you screw up because you weren't paying attention, apologize. I spaced out on a ride the other day and had a close call with a very nice man crossing the street. He clearly had the right-of-way so I stopped and apologized profusely for my mistake. It's all about trying to build up a healthly relationship between cyclists, cars, and pedestrians where everyone can be safe and get where they're going. Do be safe. And don't be a jerk.